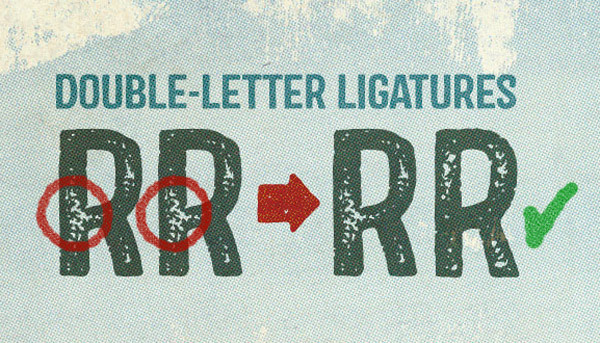 In the past I’ve always kept away from distressed style fonts for the basic reason that using the same letter twice within any word in your design stands out like a sore thumb as the weathered markings are identical between them. However, I’ve just come across this huge creative fonts bundle on Design Cuts that contains a bunch of incredible fonts that bypass this problem by including loads of additional variations with different levels of wear and tear. This means you can easily achieve awesome distressed effects without having to texturise your text manually. What’s more, many of these fonts also come with amazing extras, such as ornaments, ligatures, banners and borders. I’m sure you’ll be as blown away as I am with these! 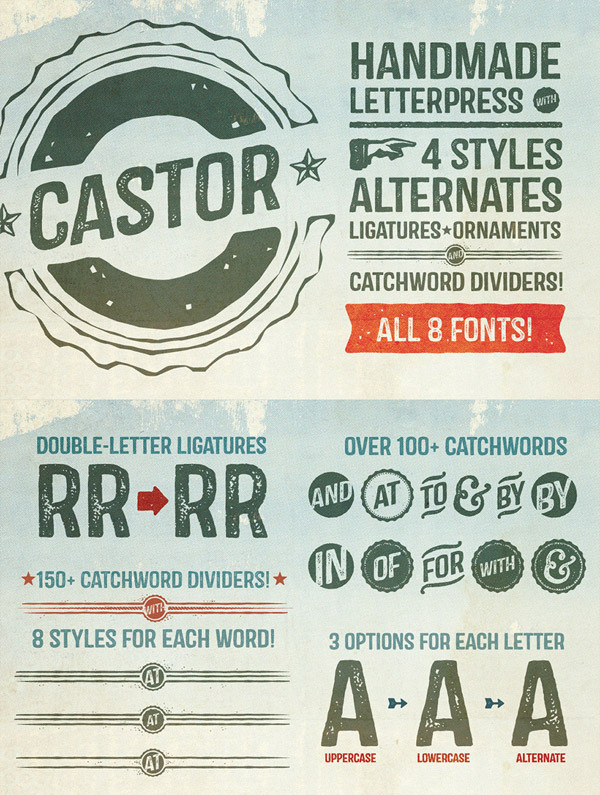 The Castor font is supplied as the complete font family, which includes four variations each made up of 500 glyphs. Then there’s the extras; 400 catchwords, dividers and ornaments making it an all-in-one pack for creating trendy retro style badges and insignias. Veneer is a great example of the multiple variations that are available for these distressed fonts. This opens up loads of options for customisation to disguise the fact that the whole effect is created using a font. 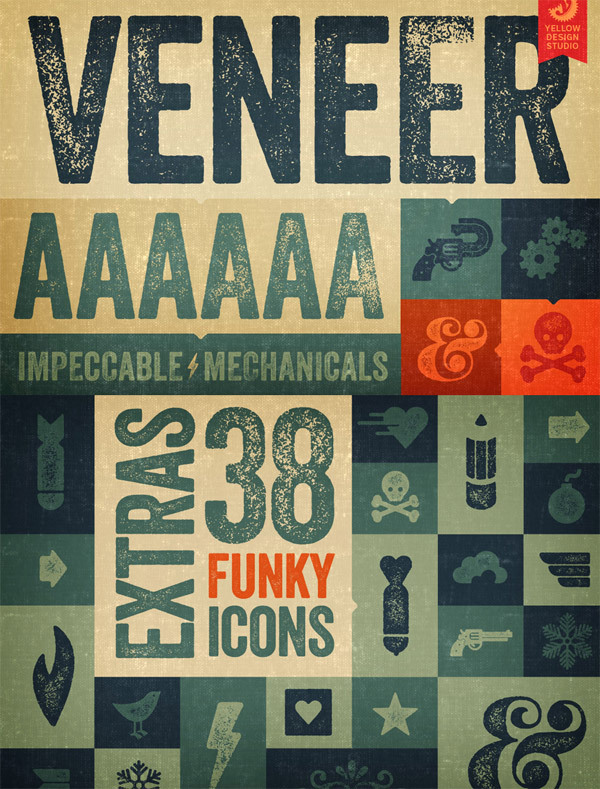 Veneer is another font that also comes packed with additional graphics, this time a load of really cool weathered icons. I love the style (and name!) 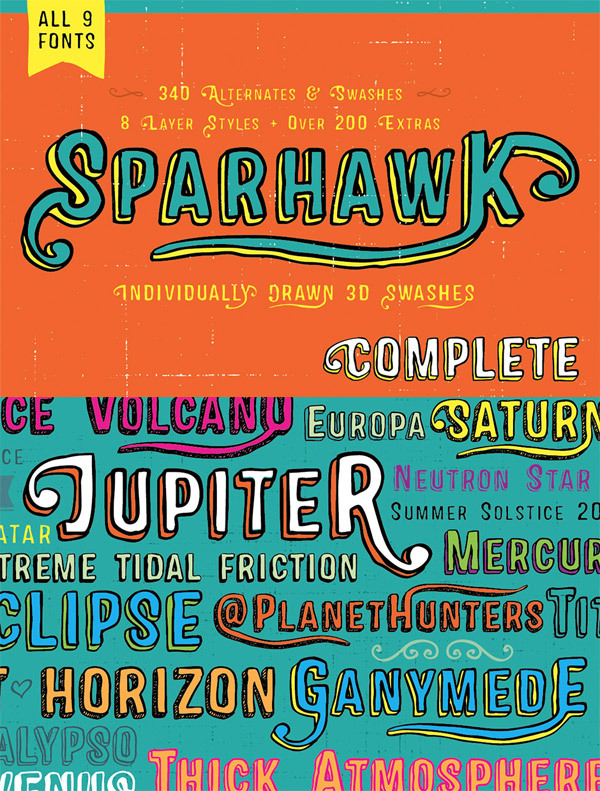 of this Sparhawk font. Its hand drawn 3D appearance not only looks really cool, it also comes with loads of alternative glyphs so you can pick out unique ligatures and tails for that authentic hand lettered look. This huge creative fonts bundle contains 11 best selling fonts all based on a hand drawn or weathered theme. In true Design Cuts style this is once again being squashed in price by 95% for a limited time, making the $595 worth of goodies available for just $28. For this price you’re lucky to get 1-2 fonts, but 11 is mega value, especially considering all the extra elements that are combined with each one. I’ve only been able to share preview of a few of the fonts available in this fantastic bundle, but there’s also huge font families named Altus, Oil Change, Appareo, Ride My Bike, Trend and Anodyne all with their own additions and extras, making this one attractive bundle! As if that isn’t awesome enough, this deal also comes with Web Fonts for each one and an Extended License which means you can use these fonts in designs you intend to sell. I’d definitely recommend checking out the full details on Design Cuts, this is one offer that’s too good to pass up! Thanks for sharing such a nice find. 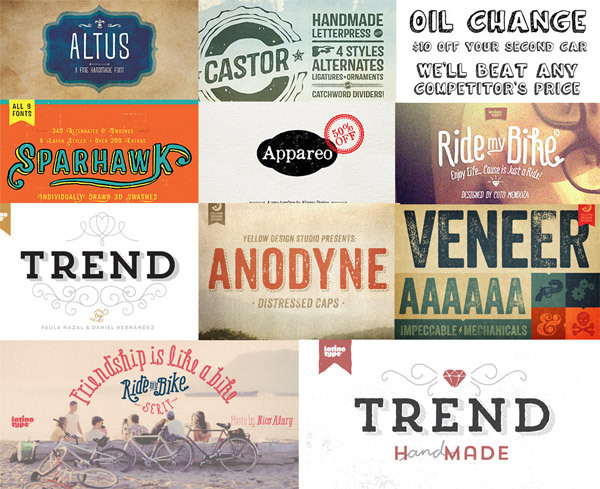 Kudos..
Hi, this font bundle seems too good to be true! Can I ask, does the web licence extend to embedding these fonts into an app?